Belgrave Hall is a manor house which was build in 1709 by Edmund Craddock in a 2 acre area of walled gardens. The hall was passed down from family to family until in 1936, when it was sold to Leicester City Council for the princely sum of £10,500! From that time onwards the Hall became a museum and the grounds were opened to the public as period and botanical gardens. 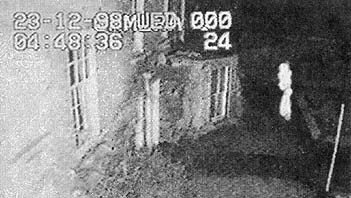 On a freezing cold December morning in 1998, security cameras were triggered at 4:50am by two white, ghostly figures moving around just outside the entrance, along with a strange mist. The media was alerted and it was soon world news that a ghost had been caught on video... but this has yet to be proven, with experts claiming that the figures could simply be rain, or even a spec left on the camera lens. Also if they are infact ghostly figures they'd be around ten feet tall. Hmmmm, interesting footage but not 100% convincing methinks. For a number of years, people have reported seeing ghosts at the hall. Who could they be? Well, some believe one spirit is Charlotte Ellis, the daughter of John Ellis, the former owner of the house. Also, on the upper floor of the hall is an unknown "strong and violent" male energy and also the ghost of a young boy who is thought to have died of tuberculosis. 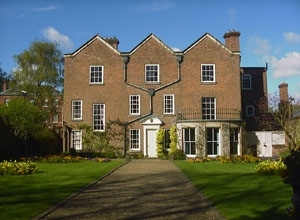 Whether the images of the supposed ghostly figures (pictured above) are of paranormal origins or not, the hall surely lives up to its reputation as one of Leicestershire's most haunted locations.